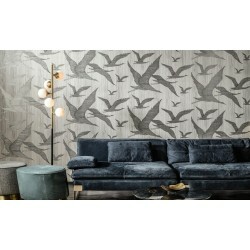 The finest brands of wallpapers and tapestries are available : Farrow & Ball, Elitis, Sandberg, Thibaut, Au Fil des Couleurs. Wallpapers There are 4 products. Discover our handcrafted wallpapers, made using Farrow & Ball paints. Little Greene is a manufacturer of high quality English paint, heavily involved socially and ecologically. Coming from the world of high-end paint, the brand has come naturally to the creation of luxury wallpapers. Little Greene uses special printing methods fot its wallpapers. With a wide choice of colors and high-end finishes, Little Greene paints are very qualitatively associated with wallpapers for joinery. Mixing the old and the new, Little Greene offers a complete line of wallpapers blending the best from the past with the most advanced technological innovations. Sandberg is a Swedish design company passionate about craftsmanship. We believe in sustainability, people and that the home is the starting point for well-being. We design and manufacture wallpaper and accessories with an unique expression in our own factory in Ulricehamn. The love of craftsmanship is evident at every step of the way, and is a crucial component in what we call Swedish wallpaper art. Au fil des Couleurs is the famous and major shop by quality wallpapers, and the fantastic diversity of publishers and creators who are presented. collection playing with our eyes, offering perspective, realism, relief, journey and reverie ... to your interior. Since 1875 Cole & Son wallpapers have represented styles across the centuries and include some of the most historic wallpaper designs in the world. Their wallpapers are in many historic houses including Buckingham Palace. Since its origins in 1981, Arte is a renowned brand for its passion for beautiful wall coverings. Established in Belgium, the wallpaper company is active in more than 80 countries and in Paris in its showroom located in Saint-Germain-des-Près since 2010. Arte offers roller wallpapers, per meter as well as decorative panels. Canopy plays with the natural structure of plants. The result is a geometrical interplay with climbing plants in an unusual context. Hover depicts birds in their most natural form. Anyone who comes closer will see that the silhouettes consist of fine lines. Here too, the wood look in the background ensures that the forest never seems far away. With Matrix on your wall, you will imagine yourself in oriental atmospheres. This design gives you a simple way to create the look of wall tiles in your home. In combination with the shiny relief ink, this pattern is given a very realistic tile structure. Wallpaper pattern inspired by herringbone woven textile that provides a warm and cosy feel. The Marsala-colored wallpaper gives the room a timeless and modern expression.